Tired of the 1970’s kitchen cabinets and appliances? We can design the perfect cooking and dining areas for today’s hectic life style. 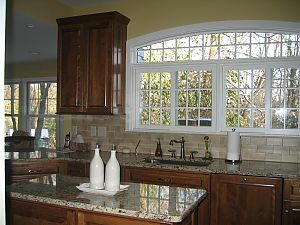 Our kitchen remodeling team will design the kitchen of your dreams. Let us show you how the latest designs and trends in cabinetry, counter tops and appliances can spice up your kitchen and dining experience. Custom or Semi Custom wood cabinetry in today’s hottest styles, wood species and stain or paint finishes combined with solid surface, granite or Quartz counter tops, all complimented by the use of today’s major appliance brands guarantees your dream kitchen of tomorrow. Quality workmanship shines thru on our complete bathroom remodeling. We combine luxury finishes, brand name fixtures and today’s latest design trends to create a truly updated bathroom for today. Experienced licensed master plumbers and electricians will work along side our hourly employees to create the comfort and elegance you desire.